Prime Minister Ehud Olmert pledged stiff retaliation for a rocket attack from Gaza on an Israeli city, the first time militants have reached the heart of a population center, with Israel already stepping up its weeklong offensive in the seaside territory. Olmert called the rocket fire on the coastal city of Ashkelon Tuesday a "major escalation," coming just hours after a deadline set by the militants holding an Israeli soldier passed with Israel rejecting demands to release Palestinian prisoners. Early Wednesday, Israeli aircraft targeted the Palestinian Interior Ministry for the second time in a week, the Israeli military said. Witnesses said missiles hit the main structure again and damaged a building next to the ministry. Rescue workers said five people were wounded. The two top floors of the main building collapsed, and the second building, which provides housing for ministry employees, was set on fire, witnesses said. In other attacks early Wednesday, Israeli aircraft fired missiles at a Hamas camp in southern Gaza and a Hamas-affiliated school in Gaza City. No one was hurt. The rocket fired by Gaza militants Tuesday flew 12 kilometers (7 miles) and exploded in the courtyard of a school in Ashkelon, a city of 110,000 on Israel's seacoast north of Gaza. School security cameras showed a large cloud of white dust rising from the point of impact. The school was empty at the time and no one was hurt. 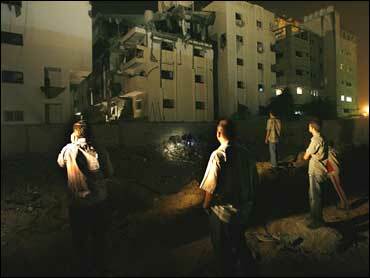 Though militants have launched many of the small, homemade rockets in the direction of Ashkelon, this was the first one to hit the center of the city, displaying a longer range than most previous ones and bringing the threat of rocket barrages to a major Israeli population center for the first time. Zeev Schiff, veteran military analyst for the respected Israeli Haaretz daily, wrote that the rocket attack on Ashkelon was "an unequivocal Hamas invitation to war." Speaking at a U.S. Independence Day celebration at the home of Richard Jones, the U.S. ambassador to Israel, Olmert warned, "For this attempt that was meant to harm Israeli civilians who live in the sovereign borders of Israel, there will be far-reaching consequences. The Hamas organization will be the first to feel this." In the hours before the rocket attack, Israeli forces were already operating in northern Gaza with a mission of looking for tunnels, explosives, weapons warehouses and other facilities used by militants, according to the area army commander. However, the troops stayed outside from Palestinian towns, as they have since Israel started its offensive in Gaza a week ago. Olmert indicated that might change in response to the rocket attack on Ashkelon. Olmert and Defense Minister Amir Peretz decided Tuesday to gradually step up the operation in northern Gaza, defense officials said. Earlier Tuesday, Olmert ignored a deadline to free Palestinian prisoners set by militants holding 19-year-old Israeli Cpl. Gilad Shalit. A spokesman for the Army of Islam, one of the three groups that abducted Shalit, said the militants "decided to freeze all contacts and close the case on this soldier." "We will not give any information that will give the occupation good news or reassurance," said the spokesman, Abu Muthana. But, he added, "We will not kill the soldier, if he is still alive." Olmert was defiant. "We won't negotiate with terror elements and we won't let anyone believe that kidnapping is a tool to bring Israel to its knees," he said. Olmert said he ordered the army to push forward with efforts "to strike terrorists and those who sent them and those who sponsor them. ... None of them will be immune." The threat was clearly meant for Syria, where Israeli warplanes buzzed President Bashar Assad's palace last week. Israel holds Syria responsible for Shalit's abduction, because it hosts Hamas' top leader, Khaled Mashaal, who Israel says ordered the kidnapping. In Gaza City, Palestinian Prime Minister Ismail Haniyeh of Hamas publicly called on the militants to protect the soldier. "The government is exerting efforts with Palestinian, Arab and regional parties to end this case in the appropriate manner," Haniyeh said at a Cabinet meeting. Also Tuesday, Israel opened key cargo crossing into Gaza for the second time since Sunday to allow food, fuel and other supplies into the area.